“We’ll have more guards. We’re going to try to have a ‘goat guarantee’ the first weekend,” deputy council chief Helene Åkerlind, representing the local branch of the Liberal Party, told newspaper Gefle Dagblad. “It is really important that it stays standing in its 50th year,” she added to Arbetarbladet. Obviously, what you need to free up that budget is more burning goats. Or perhaps its a credible plan on why spending it will reduce risk. I’m never quite sure. 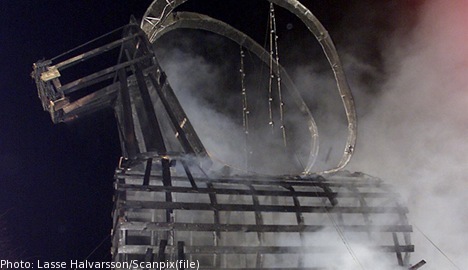 Previously: 13 Meter Straw Goat Met His Match, Gavle Goat Gone, Burning News: Gavle Goat, Gävle Goat Gambit Goes Astray, The Gavle Goat is Getting Ready to Burn!. Image: The goat’s mortal remains, immortalized in 2011 by Lasse Halvarsson.